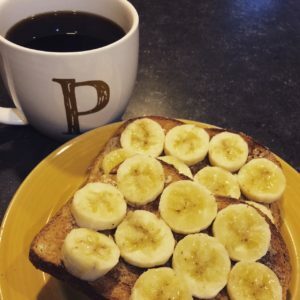 On toast, in oatmeal, solo – bananas are one of my favorite foods. I love food. Not surprising to anyone who knows me or reads the blog on occasion. As I’ve gotten older and grown wiser about what I eat, I’ve realized how important it is to eat good foods that fuel my workouts, and keep me feeling good and balanced. These are my top 11 foods for athletes and the ones I try to eat most days. Especially great for runners because they’re one of the easiest carbs for the body to digest, bananas provide fuel without a heavy feeling in your stomach. Bonus, they’re high in potassium, which is great for preventing side stitches and sore muscles. This includes them all – blue, rasp, straw & black. Berries provide beneficial antioxidants and good carbs, plus they’re a great way to satisfy a sweet craving. The closest thing to a nutritionally complete food, eggs are packed with protein and amino acids to aid in muscle repair and recovery. And don’t feel like you have to skip the yolks – there’s a lot of nutritional value in them and where most of the protein lives. I also love egg white substitutes, like Muscle Egg or Egg Beaters, often combining with regular eggs. While many would argue with me on this (yes, I’m talking to you, Paleo eaters and bodybuilders) I stand by high quality dairy, like Green Yogurt. Another great source of protein, low-fat Greek yogurt provides the kick of calcium athletes need for strong bones and stress fracture prevention. Word of warning: Not all Greek yogurt is created equal. Check labels and choose the highest protein/lowest calorie and sugar ratio. Athletes need carbs. The key is to choose smart carbs that offer additional value. Regular or even mildly-sweetened oatmeal (not the highly sweetened, full-of-added-sugar kind) is a great choice for a pre-workout breakfast, because it’s high in carbs and fiber. But it’s also low on the glycemic index, which means it gives energy that lasts. The last thing athletes want to worry about is getting bogged down by illness. Incorporate oranges into a healthy eating plan and get a giant dose of Vitamin C, the immune system’s best bud. Oranges have also been shown to aid in digestive health and reduce muscle soreness. A great energy source for athletes, peanut butter is full of fiber and protein to give a slow, sustained release of energy, and it provides heart-healthy fat. Like with Greek yogurt, watch labels. Reduced fat options might sound like a better choice, but you’ll often find them to be higher in sugar – not a smart tradeoff. As vegetables go, spinach is one of the top for protein. It’s one of the most nutrient-dense foods, packing a ton of vitamins and minerals. Spinach also offers anti-inflammatory properties which can aid in the relief of inflammation from tough workouts, as well as conditions such as asthma, arthritis and migraines. And because it’s so low in calories, feel free to pile it on! Another carb that offers additional benefits, sweet potatoes are a great source of fiber, potassium and iron. They’re delicious, easy to prepare and almost feel like a “cheat” or comfort food, satisfying that need. Bonus, they offer a good dose of Vitamins A and C to support a healthy immune system. Are they a fruit? Are they a vegetable? Not important, all you need to know is they’re full of antioxidants, vitamins and minerals that athletes need, most notable is B6. Studies have shown a lack of vitamin B6 can lead to an inability to store muscle glycogen. Best of all, they’re low in calories and so delish, they can spice up a ton of different foods or be eaten solo as a light, tasty snack. I know, I know – these aren’t technically a “food” so they sort of don’t belong here. But I’m always getting asked for my recommendation of the best protein bar and this is always the hands-down winner. There are plenty of good protein bars out there and just as many not so great. With a great calorie-to-protein ratio, low sugar and a million different flavors (okay, not really a million but enough that I haven’t even tried them all! 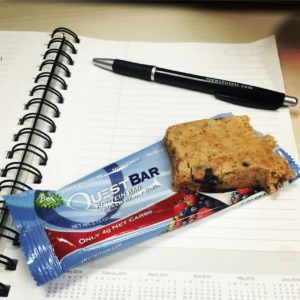 ), Quest bars are a great addition to any athlete’s eating plan. Quest Bars really are my favorite because of the variety, protein amount and low sugar! Thank you for sharing your favorites! Great minds think alike 🙂 thanks for the read & comment! !